Gillian Williamson is a research student at Birkbeck College, University of London. She recently submitted her PhD thesis on masculinity in the 18th-century Gentleman’s Magazine and is awaiting her viva in July. The Gentleman’s Magazine was the leading eighteenth-century periodical, printing at its peak 15,000 copies a month and publishing letters, articles, poems and obituaries sent in by thousands of its readers. It is not usually thought of as an emotionally invested object. From the early nineteenth century it has generally been regarded as a useful repository of random information – the weather, news and medical science for example – with a reputation for seriousness. To Robert Southey it was ‘a disgrace to the age and the country’, not even masculine, but ‘Oldwomania’. Sir Walter Scott described it as a pawnbroker’s shop with interesting articles confused amid a jumble of nonsense written by ‘reverend old gentlewomen’ correspondents. However, William Hazlitt, who also damned the magazine as ‘the last lingering remains of a former age’, had to admit that ‘we profess an affection’ to the extent that he ‘would almost wish some ill to those who can say any harm of it’. It was, perhaps, a crusty but fondly-loved aged relative. It is this intimacy between reader and magazine that I explore here. And infants lisp, what pretty things are these! And children tease mamma for Magazine. From the age of nine artist James Bisset bought it in Perth, using pocket money from an uncle. Cornelius Cardew, rector of St. Erme, Cornwall, cited his fifty years as a reader (from age ten) when he submitted an illustrated local history item in 1808. Owen Manning, vicar of Godalming and county historian of Surrey, had, wrote Thomas Collinson in 1801, ‘taken in the Gentm Magazine from the beginning of that Poplication (sic)’. As the magazine was launched in 1731 this made for seventy loyal years. Other correspondents proclaimed loyalty in their pseudonyms: ‘A very old subscriber’, ‘A Constant Reader’, ‘A Reader for Twenty Years’, ‘A Very Old Female Subscriber’. On the arrival of the Gentleman’s Magazine, if I am reading any other book (save the book of God) I constantly close it, and opening the Magazine, instantly cast my eye over the bill of fare. As soon as your Magazine arrives, it is dried, the leaves cut by my servant, and presented for my inspection. I immediately run my eye over the table of contents, wishing to read the most valuable parts first. The magazine’s well-established format and the opportunity to participate in its contents gave readers a sense of ownership and encouraged them to think of it as a dear friend or family member. Roman Catholic priest and religious controversialist Joseph Berington used the metaphor of benevolent kinship: ‘a parental solicitude’ for the magazine belonged to the editor but ‘yet is the publick not a little interested in its concerns’. It was ‘my old Chrony’ declared ‘a kind Correspondent’, and was probably Cornish anti-Jacobin Richard Polwhele’s ‘dapper comrade wrapped in blue’. Joseph Budworth/Palmer wrote to editor John Nichols: ‘I always meet with it as with an Old friend’. When a fire destroyed Nichols’ premises and much of his stock-in-trade in February 1808, readers rallied round with letters of sympathy and fresh articles to ensure the continuity of ‘their’ magazine. For ‘B.H.’ it was an attractive female companion: ‘agreeable Miss Mag.’ with whom he had ‘a long and pleasing dalliance’. Indeed, the magazine had its romantic side. Poet ‘J.S.’ recounted an evening stroll on the green with his sweetheart Polly when he whisked the magazine from his pocket and solved a rhyming puzzle with her. And readers were fond of submitting poems in which they confessed their all-too-often unrequited love for ladies thinly disguised as Celia, Daphne or Chloe. However, like those closest to us, this friend could provoke disappointment or anger. ‘Those most it mads who love it most’ as ‘L.S.R.’ put it. Readers were quick to complain if it was late or their piece had not appeared. B. Drake was outraged when his poem was not printed and planned to call round in person to retrieve it. Cardew spent eighteen months nagging to get his history article inserted. The 1813 change of cover colour from blue to buff prompted a ribbing poem from ‘S.I.P.’ (writer and actor Samuel Jackson Pratt) in which he claimed that, as a ‘constant Reader’ from ‘gay fifteen’, he had not at first recognised the ‘stranger’. Those covers clearly clothed a parent, child, friend or even lover, with whom readers shared a multiplicity of emotions. Gentleman’s Magazine (‘GM’), Preface, 1764. 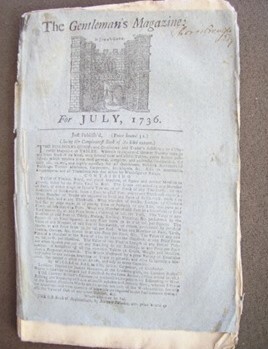 15,000 copies a month were printed during the 1745-6 Jacobite invasion crisis. Letter to old school friend Grosvenor Charles Bedford, 23.4.1804 (Southey, Rev. C.C. (ed. ), The life and correspondence of Robert Southey, 6 vols., (London, 1849-1850), II, pp. 281-2). Scott, Sir W., The Journal of Sir Walter Scott, from the original manuscripts at Abbotsford, 2 vols., (Edinburgh, 1891), II, p. 198. Edinburgh Review, 38.76 (May 1823), pp. 349-378. ODNB; Cardew: 12.9.1809, Bodleian: MS.Eng.Lett.c.356, f.210; and Collinson: letter, 9.1.1801 (private collection). See Peoples, P., ‘The Folger Nichols Manuscript Collection: A Description and Analysis’, (unpublished PhD thesis, University of Wisconsin-Milwaukee, 1980), pp.290, 291, and 294, GM, 4.1808, p.295. Anonymous prefatory poem , 7.1810. GM, 2.1797, pp.95-96 and 7.1799, p. 556. GM, Preface, 1766; Polwhele, R., The Old English Gentleman. A Poem, (London, 1797), p. 87. See the many letters in Nichols’ correspondence in Bodleian: MS.Eng.Lett.c.372. Letter, 24.11.1735, British Library: Stowe, f.144. © Gillian Williamson and Emotional Objects, 2014. If citing, please kindly refer to the post’s author, title and date, with a link to the original site. Unauthorized duplication of this material without express permission is strictly prohibited.